Boofa at 6 years old has now matured into the sussex I hoped he would be - with his superb headpiece he typifies the 5 "L"s of the sussex breed - Long,Low,Level,Large in bone and Golden Liver!! 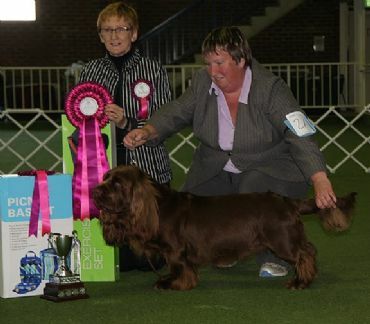 Number One sussex (Dogzonline All breeds system 2009) and 2010 in both the breed and the allbreed system and leading again in 2011. 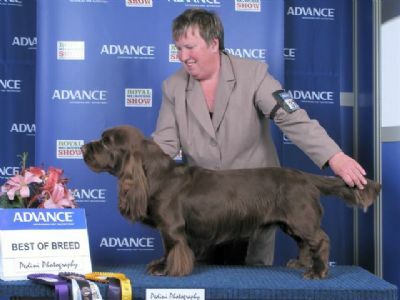 A Multi Best In Show(all breeds),multi best in group multi runner up in groups,multi Royal BOB winner ,multi class in show winner at both all breeds shows and the Rarer Gundog Spaniel club !In 2010 Boof was Best in Show at the rarer Gundog Spaniel Club of Victoria June Show and Runner Up Best in Show at the November show as well as Best Rarer Gundog Spaniel at the Victorian Gundog Show in November. 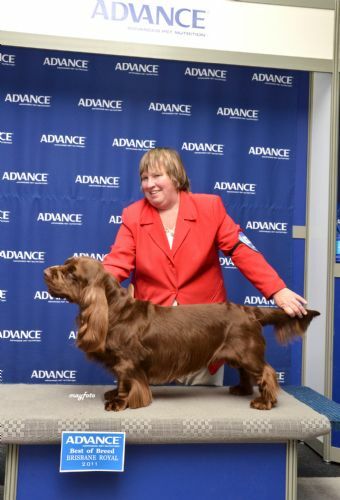 The first Sussex to qualify for his Grand Championship under the new system and both a second generation best in Show winner and grand champion! for Australia in 2011 -DOL. 2012 - Boof is third in the group at Melbourne Royal! !